Mr. English Coffee Blog. : Coffee with the Stars. It looks like the paper cup is the way to go for the famous. Now, I don't really know, maybe they get up and drink the finest coffee in the world in nice china in their large mansions and then pop in later to Starbucks, Peets or the like to be seen. I wish I could find out if there are any famous people in the world that drink great coffee. I wonder what it is like being a worker in one of these places when someone like Eddie Murphy walks in. I wonder if the workers are allowed to acknowledge who he is. Or if they have to pretend that he's just an ordinary Joe getting a cup of himself. Albeit in places like Beverly Hills that the staff in most establishments are probably pretty numb to glitzyness of it all. I wonder how Eddie orders his coffee? "Yo! 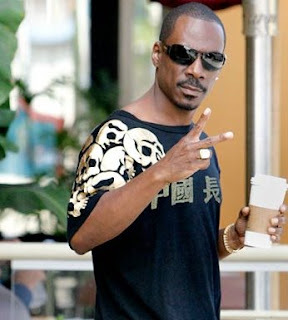 I'd like a large f....... latte...with some of that caramel sh.. in it b....." Seriously, if I had to make someone like Eddie Murphy a latte it would ,I'm sure, be impossible to keep a straight face. He's quite the comedian and I doubt that he can just turn it off when it comes to ordering his favorite coffee.